Well Scott Sumner has hung up the keyboard. In his “I’m not really serious but actually I am” kind of way, he takes credit for quantitative easing and several trillion dollars in new wealth. It’s too long to reproduce the argument here, but he’s basically saying that bloggers forced Bernanke / gave him the support to inflate more, and that has resuscitated global stock markets. Don’t worry Scott, you are not being arrogant. I too hold you fully responsible for what happens to the world economy. …I am complete[ly] burned out, and have been for months. I’ve blogged an average of eight hours a day, seven days a week, for over two years. I’ve only kept going in recent months out of a sense of obligation to keep pushing these issues. But now that lots of other people are saying the exact same thing, it’s time for me to take a break. Incidentally, I don’t think he’s exaggerating. Scott spends (spent) an incredible amount of time fielding the comments in his blog posts, and he must also have spent a lot of time reading other people’s stuff. ==> After breaking the back of inflation and ushering in the Reagan boom, Paul Volcker turned over the keys to the Fed to Alan Greenspan in August 1987. 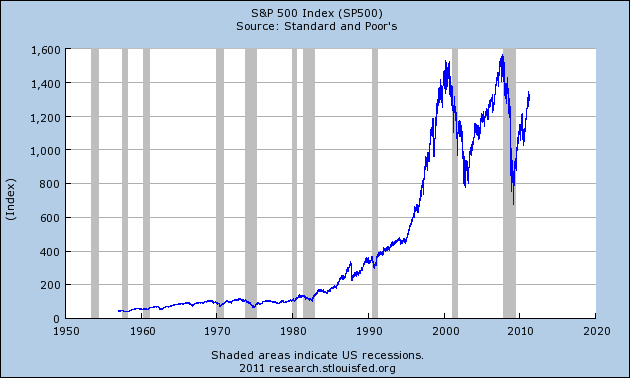 In October 1987, the world suffered the worst stock market crash in history. ==> After presiding over the Great Moderation, and expertly guiding the US economy through the dot-com crash with a surprisingly soft landing, the Maestro Alan Greenspan handed over the keys to the Fed to Ben Bernanke in January 2006. We all know how that turned out. This entry was posted in 2008 to sometime recession, Economics. Bookmark the permalink.